Hippurate is the glycine conjugate of benzoic acid. When hippurate is hydrolysed by an organism glycine and benzoic acid are formed. In the classical test (48 hour), The benzoic acid produced was detected using ferric chloride indicator, by its precipitation in an excess of ferric chloride. Gas Liquid Chromatography (GLC) method for detection of benzoic acid is also available nowadays. 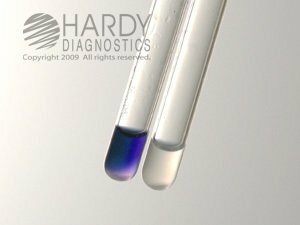 In the rapid test (2 hour) Ninhydrin is used as the indicator to detect Glycine, the second byproduct of hippurate hydrolysis. Ninhydrin reacts with glycine to form a deep blue or purple color (Ruhemann’s purple). This rapid test used in most laboratories is one of several variations of the ninhydrin tube test described by Hwang and Ederer for detection of glycine. Hippuric acid is hydrolyzed to benzoic acid and glycine by the enzymatic action of hippuricase. The glycine end product is detected by the addition of ninhydrin reagent. Hippurate hydrolysis test is critical for separation of Campylobacter jejuni (hydrolyzes hippurate) and Campylobacter coli (negative) strains. Aids in the differentiation of β-hemolytic Streptococcus agalactiae from other β-hemolytic streptococci. Take or prepare Sterile Sodium Hippurate broth and inoculate with test organism. Centrifuge the broth and remove the precipitate. Add Ferric chloride reagent in the supernatant. To a hippurate test tube, add 0.2ml (3-4 drops) of distilled water at a pH of 6.8-7.2. Using a heavy inoculum) from an 18-24 hour culture, make a heavy suspension of the organism in the Hippurate Reagent with a standard inoculating loop (The tube should be cloudy looking after inoculation, turbid.). Incubate the tube for two hours at 35-37°C. During the incubation period, reconstitute the Ninhydrin indicator solution in the dropper bottle by adding 2ml of distilled water at a pH of 6.8-7.2. Replace the cap tip and cap, and vigorously shake for one minute. Let stand at room temperature for 30 minutes or until all the substrate has dissolved. After the two hour incubation period, add two drops of the Ninhydrin indicator solution to the hippurate reagent and organism mixture. Re-incubate at 35-37°C for 30 minutes. Observe the tubes at 10 minute intervals for the appearance of a deep blue color, which is a positive test. The color change will usually appear in 10 to 15 minutes after the Ninhydrin indicator solution has been added. For quality control grow the ATCC strains in Sodium Hippurate Broth and look for the results. Streptoccus pyogenes (ATCC 19615): Moderate to heavy growth; Hippurate not hydrolyzed. short and sweet. Excellent sir.